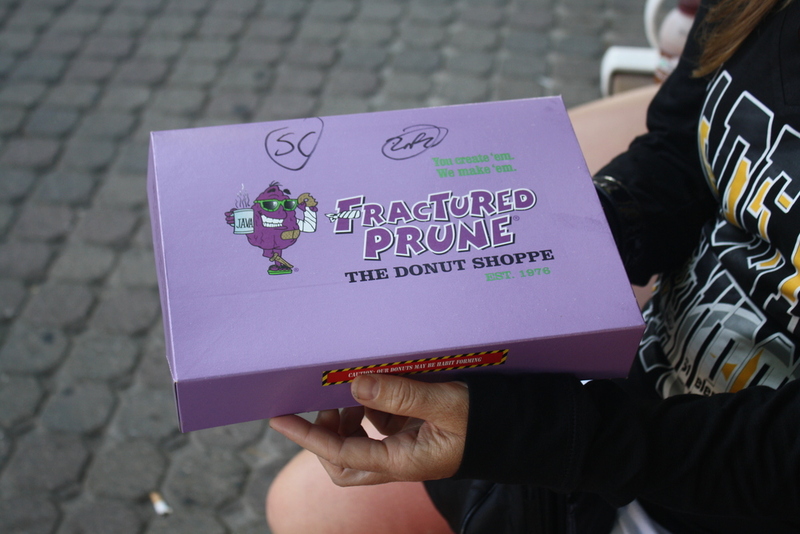 The Fractured Prune is a donut shop that started out in Ocean City and has grown to various other locations on the east coast. I'm not really a big donut fan. I eat maybe 2 or 3 a year and they all come from the Fractured Prune. They have various unique donuts to choose from. You can choose from their large variety of donuts or you can choose your own. There are glazes, toppings, and sugars that you can choose from. Each donut is hand dipped to perfection and will literally melt in your mouth. This year we got the donuts pictured above and breakfast sandwiches. (I forgot to mention that.) Their breakfast sandwiches are tasty as well! I had just an egg and cheese bagel and mmm, I had it down in about 2 minutes. We got: Peppermint Patty donut- I didn't try it because I'm not a fan of peppermint patties. But everyone else enjoyed it! Blueberry Hill donut- This was my favorite one. Absolutely fantastic. Strawberry Shortcake donut- This one was great as well. I really love how they top it off with graham crackers. It adds that little extra crunch. OC Sand donut (2x)- My sister likes just plain donuts and so she got this and really enjoyed it. It's just a honey glaze and cinnamon sugar. All of you simple people out there, I recommend this for you. Creamsicle donut- This donut was okay. If you really enjoy creamsicle flavoring then I recommend it, if not then go for something else. They offer over 20 different specialty donuts for you to choose from, so you're bound to find that will leave your mouth watering for more!